Hudson is a city located along the west border of Columbia County, New York, United States. As of the 2010 census it had a population of 6,713. The city is named after the adjacent Hudson River and ultimately after the explorer Henry Hudson. Hudson is the county seat of Columbia County. Hudson is sister city with Pallisa, Uganda. According to the United States Census Bureau, the city has a total area of 2.3 square miles (6.0 km2). 2.2 square miles (5.6 km2) of it is land and 0.15 square miles (0.4 km2), or 7.38%, is water. Hudson is located on what began as a spit of land jutting into the Hudson River between the South Bay and North Bay, now both largely filled in. Across the Hudson River lies the town of Athens in Greene County, New York; a ferry connected the two municipalities during much of the 19th century. Between them lies Middle Ground Flats, a former sandbar that grew due to both natural silting and also from dumping the spoils of dredging; today it is inhabited by deer and a few occupants of quasi-legal summer shanties. As of the census of 2010, there were 6,713 people, 2,911 households, and 1,390 families residing in the city. The population was 6,713 at the 2000 census, and has since been estimated at 7,296  in 2003, and at 6,985  in 2006, and at 6,713 at the 2010 census. These numbers include the approximately 500 residents of the local Hudson Correctional Facility. Recent population declines may be attributable to real estate trends in which retirees, young couples, childless couples, singles and weekenders have been gradually replacing larger families and converting apartment buildings to single-family homes, as the number of unoccupied homes and tax delinquency has declined. The population density was 3,468.2 inhabitants per square mile (1,338.7/km²). There were 2,911 housing units at an average density of 1,542.8 per square mile (595.5/km²). The racial makeup of the city was 60.29 (49% Non-Hispanic) White, 28.02% African American, 0.28% Native American, 2.84% Asian, 0.01% Pacific Islander,and 4.41% from two or more races. Hispanic or Latino of any race were 16.41% of the population. There were 2,951 households out of which 28.6% had children under the age of 18 living with them, 29.4% were married couples living together, 19.6% had a female householder with no husband present, and 46.1% were non-families. 39.0% of all households were made up of individuals and 15.5% had someone living alone who was 65 years of age or older. The average household size was 2.26 and the average family size was 3.00. In the city the population was spread out with 23.7% under the age of 18, 9.4% from 18 to 24, 30.0% from 25 to 44, 21.0% from 45 to 64, and 16.0% who were 65 years of age or older. The median age was 37 years. For every 100 females there were 106.7 males. For every 100 females age 18 and over, there were 105.6 males. The median income for a household in the city was $24,279, and the median income for a family was $27,594. Males had a median income of $26,274 versus $22,598 for females. The per capita income for the city was $15,759. About 23.8% of families and 25.6% of the population were below the poverty line, including 37.7% of those under age 18 and 13.9% of those age 65 or over. The land was purchased from native Mahicans by Dutch settlers in 1662 and was originally part of the town of Claverack; formerly it was known as "Claverack Landing". Settled by New England whalers and merchants hailing primarily from Nantucket, Martha's Vineyard, and Providence, Hudson was chartered as a city in 1785. The self-described "Proprietors" laid out a city grid, and Hudson grew rapidly as an active port, coming within one vote of being named the capital of New York state. The city grew rapidly and by 1790 was the 24th largest city in the United States. As late as 1820, it was the fourth largest city in New York. Martin Van Buren opened his first law office in Hudson. Margaret B. Schram's Hudson's Merchants and Whalers: 1783-1850 tells the story of the city's maritime history. On March 1, 1794, General William Jenkins Worth, the future liberator of Texas in the Mexican–American War, was born on Union Street in Hudson. The house where he was born still stands. Worth Avenue in the city is named after him, as is Fort Worth, Texas. Sanford Robinson Gifford, a member of the second generation of Hudson River School of landscape painters, was born in Hudson on July 10, 1823, and following his death on August 29, 1880, was buried in Hudson's Cedar Park Cemetery. Hudson obtained a new charter in 1895. In 1935, to celebrate the sesquicentennial of the city, the United States Mint issued the Hudson Half Dollar. The coin is one of the rarest ever minted by the United States Government, with only 10,008 coins struck. On the front of the coin is Henry Hudson's ship the Half Moon, and on the reverse is the seal of the city. Local legend has it that coin was minted on the direct order of President Franklin Delano Roosevelt to thank the Hudson City Democratic Committee for being the first to endorse him for state senator and governor. In the late 19th and first half of the 20th century, Hudson became notorious as a center of vice, especially gambling and prostitution, as described in Bruce Edward Hall's book, Diamond Street: The Story of the Little Town with the Big Red Light District. (The former Diamond Street is today Columbia Street.) At the peak of the vice industry, Hudson also boasted more than 50 bars. These rackets were mostly broken up in 1951 after surprise raids of Hudson whorehouses by New York state troopers under orders from then-Governor Thomas E. Dewey netted, among other catches, several local policemen. After a steep decline in the 1960s and '70s, the city has undergone a significant revival. A group of antiques dealers opened shops on the city's main thoroughfare, Warren Street, in the mid-1980s, the earliest being the Hudson Antiques Center, founded by Alain Pioton, and the English Antiques Center. Their numbers grew from a handful in the 1980s to almost seventy shops now, represented by the Hudson Antiques Dealers Association (HADA). Following this business revival, the city experienced a residential revival as well, and is now known for its active arts scene, antiques shops, restaurants, art galleries and nightlife. 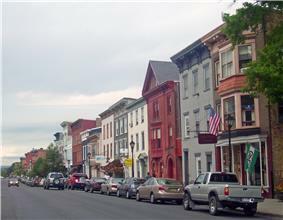 In the last few years, perhaps encouraged by the number of gay business owners among the original antiques dealers, Hudson has become a destination for gay people who have opened new businesses, moved here from larger urban areas, and who have been in the forefront of the restoration of many of the city's historic houses. In 2010, Hudson hosted its first gay pride parade, which was attended by several hundred people. With hundreds of properties listed or eligible to be listed in the State and National Registers of historic places, Hudson has been called the "finest dictionary of American architecture in New York State". The vast majority of properties in the Register-listed Hudson Historic District are considered contributing. A discussion of Hudson's architecture, its history, and recent revival, together with a collection of 200 period photographs of the city spanning the mid-19th to the early 20th century, is Historic Hudson: An Architectural Portrait by historian Byrne Fone. In the 1990s and early 21st century, Hudson has had five mayors: William Allen, Dolly Allen, Richard Scalera, Kenneth Cranna and Richard Tracy. During that time Scalera has been elected mayor seven times, but declined to run twice. This period has been marked by unusual levels of friction between elected officials and residents as the demographics and economics of the city have shifted. This was followed from late 1998 until spring 2005 by a land use conflict between St. Lawrence Cement (SLC), a subsidiary of what was then one of the world's largest cement companies, the Swiss multinational giant Holderbank (since renamed Holcim), and private citizens. The company proposed a massive, coal-fired cement manufacturing project sprawling over 1,800 acres (7.3 km2) in the city of Hudson and the town of Greenport. Sustained grassroots opposition to the project was spearheaded by business owner Peter Jung and journalist Sam Pratt, co-founders of Friends of Hudson (FOH). The controversy garnered national attention from news outlets such as CNN and The New York Times, as well as media outlets in Canada and Switzerland. The project was withdrawn after Secretary of State Randy Daniels determined that the company's plans were inconsistent with the State's 24 Coastal policies, an outcome which opponents described as "a colossal relief" and supporters denounced as "flawed in its logic". Nearly 14,000 public comments were received by the State's Division of Coastal Resources (87% of them opposed to the project), a record for that agency. Hudson is home to the FASNY (Firemen's Association of the State of New York) Museum of Firefighting, one of the largest fire service-centered museums in the world. It is on the grounds of the FASNY Firemen's home, the first old-age/nursing home for firemen in the country. The Marina Abramović Institute (MAI) is a proposed multi-functional museum space in Hudson. It was created by the internationally renowned performance artist Marina Abramović. MAI is a platform for "long durational works", i.e. any work (of music, opera, film, theater, performance art, science, and others) whose performance exceeds six hours. A long durational work encourages both its performers and the audience to step outside of traditional conceptions of time and examine what this experience means to them. MAI uses what is known as the "Abramovic Method" to help participants to develop skills for observing long durational performances through "a series of exercises and environments designed to increase awareness of their physical and mental experience in the moment". The institute may open as early as 2016. The Hudson Music Festival is an annual event established in 2011 and is currently New York's largest free music festival. The fourth annual Hudson Music Festival took place August 8, 9 & 10, 2014 and showcased 100 acts. The Hudson Opera House is located on Warren Street in the center of the city. The building offers "a year-round schedule of arts and cultural programming in the 1855 former Hudson City Hall which contains New York State's oldest surviving theatre." The Adirondack, operating daily in both directions between Montreal and New York City. All Empire Service trains, operating several times daily in both directions between New York City and either Albany-Rensselaer or Buffalo. The Ethan Allen Express, operating daily in both directions between New York City and Rutland, Vermont. The Maple Leaf, operating daily in both directions between New York City and Toronto. ^ a b "Geographic Identifiers: 2010 Demographic Profile Data (G001): Hudson city, New York". U.S. Census Bureau, American Factfinder. Retrieved December 8, 2014. ^ Smith, Gene. "America on the Hudson" American Heritage, April/May 2004. ^ Public Broadcasting System (PBS): "Jung co-founded Friends of Hudson and served as president of the organization throughout most of its six-year battle with St. Lawrence Cement." ^ Public Broadcasting System (PBS): "Pratt is the devoted co-founder and executive director of Friends of Hudson, the grassroots organization that has helped score a series of against-the-odds environmental and political victories in the Hudson Valley, including the fight against the St. Lawrence Cement plant proposal." ^ The Business Review (April 25, 2005). "Secretary of state rejects St. Lawrence Cement plant on Hudson". ^ BCNYS (April 21, 2005). "Council Sharply Criticizes the Pataki Administration's Decision on the Proposed St. Lawrence Cement Plant". The Business Council of New York State. Retrieved 2011-10-30. ^ Friends of Hudson (March 28, 2005). "87% Of Commenters Oppose Cement Plant". Friends Of Hudson. Retrieved 2011-10-30. ^ Amy Griffinl. "Basilica Hudson a new temple of contemporary art", Times Union, July 24, 2011. Retrieved August 9, 2013. ^ Peter Aaron. "Melissa Auf der Maur: Girl from the North Country", Chronogram, March 1, 2011. Retrieved August 9, 2013. ^ Clayton, Adam (November 13, 2013). "Ginsberg’s owner brings her ‘Farmhouse Rules’ to Food Network - Columbia-Greene Media: News". Chatham Courier. Retrieved May 13, 2014. ^ Nieman Culpepper, Carrie (September 5, 2010). "Hudson, N.Y.: Where Bands Feel at Home". The New York Times. Retrieved 2011-03-19. ^ Waldman, Scott (6 January 2012). 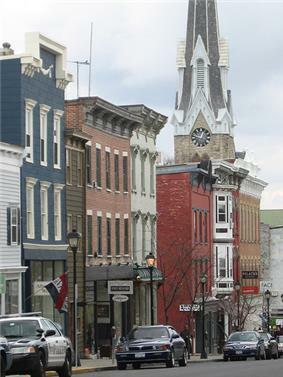 "Hudson grows as a musician-friendly town". Times Union. Retrieved 2 October 2013.